Virtually everyone knows -- or should know -- about the experiences of Benjamin Franklin, Thomas Jefferson and other Americans in Paris during and following the American War for Independence. Most educated people can place Ernest and Hadley Hemingway, Scott and Zelda Fitzgerald, Gertrude Stein and Alice B. Toklas and other American expats in the French capital in the 1920s. But how many people know that Samuel F.B. Morse got the idea for the telegraph (Morse Code, anyone?) while studying art in Paris and creating a gigantic painting at the Louvre? Or that Morse was an outstanding painter as well as a prolific inventor? Morse's story and those of dozens of other Americans who were obsessed with Paris from about 1830 to 1900 are told brilliantly by David McCullough in "The Greater Journey: Americans in Paris" (Simon & Schuster, 576 pages, black and white and color illustrations, notes, bibliography, index, $37.50). If you read only one nonfiction book this year -- God forbid! 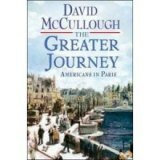 -- "The Greater Journey" by two-time Pulitzer Prize winner McCullough should be that book. Many of the artists, medical students, aspiring architects, writers and others who came to Paris in the period examined by McCullough ("Truman", "John Adams", "The Path Between the Seas" and "Mornings on Horseback") were fairly affluent and were able to take advantage of the lower cost of living to get the best education in the world in their fields. Yes, the cost of living in Paris was lower than New York, Boston, Chicago, Philadelphia and other cities where the Americans came from. Many more were poor, like aspiring sculptor Augustus Saint-Gaudens, the son of an immigrant shoemaker in New York who had to support himself while he was training to become on of America's greatest sculptors, with famous statues of Civil War heroes Admiral David Farragut and Gen. William T. Sherman in his hometown of New York. (The Sherman statue is at Grand Army Plaza, the southeast corner of Central Park, Fifth Avenue and 59th Street). Americans came because they were ambitious and smart enough to know that the best education for a painter or sculptor or architect or physician was in Paris. They didn't come for the climate, because the French capital, at the latitude of Newfoundland, had rigorous winters that reminded those from Chicago or Philadelphia or Boston of home, sweltering summers and a few beautiful months of spring and autumn. Getting there wasn't half the fun, as the saying goes: It was often hazardous and almost always uncomfortable in the days of sailing ships and early steamships. Most had never left home and most lacked the advantage of Saint-Gaudens, who had a French father and an Irish mother and spoke fluent French. Among the medical students at the Sorbonne was Charles Sumner, who came for the education and went away with an understanding of human rights as he saw black students treated the same as white -- which never would have happened back home. Sumner became an abolitionist , was elected to the U.S. Senate in 1851, and was attacked and beaten on the Senate floor on May 22, 1856 by a Southerner who objected to his views. Elizabeth Blackwell, the first female doctor in America, had to go to the Sorbonne because medical schools in the States -- the vast majority of which were inferior -- didn't admit women. (This equal treatment is somewhat curious because women didn't get the vote in France until 1945). Another medical student, Oliver Wendell Holmes , described his happiness in "being at the center of things" in his letters to home. What Holmes, Blackwell, Sumner and others learned in Paris would end up reforming the rough-and-ready medical training in the U.S.
A good friend of Morse's, James Fenimore Cooper, was another American who expanded his horizons as he wrote about the American frontier, in Paris. "Home, Sweet Home" ("Mid pleasures and palaces / Though we may roam / Be it ever so humble / There's no place like home") was written by an American in Paris, John Howard Payne. American ambassador to France, Elihu Washburne, appointed by another Galena, Illinois resident, President U.S. Grant. Washburne described the horrors of the long siege of Paris in 1870-71, during the Franco-Prussian War and the starvation and suffering endured by the people of Paris for an absolutely stupid and purposeless war (do people really get the leaders they deserve? Are they that unfortunate?). The account by Washburne is from his diary that is drawn upon for the first time and McCullough credits researcher Mike Hill for uncovering the diary at the Library of Congress. Maine native Washburne stayed the course, remaining at his post, even during the even more horrific atrocities of the Commune of 1871, unlike other ambassadors who fled Paris. Artists Mary Cassatt, the only American woman invited to join their group by the Impressionists, and John Singer Sargent, along with Saint-Gaudens -- three of the all-time greatest American artists -- flourished in Paris, inspired by the works of art and the ready acceptance of foreigners (etrangers in French, literally "strangers") by Parisians. McCullough, in my opinion, is the nation's best popular historian since Barbara Tuchman ("The Guns of August," "The Zimmermann Telegram," "Stillwell and the American Experience in China'). Both Tuchman and McCullough are very readable authors, extremely accessible to the general reader. They both make history fun to read -- and that's a good thing in this increasingly post-literate world. Read and re-read "The Greater Journey." It's available in eBook and audiobook versions, but my preference would be the print edition. It's a book that should remind us that the author, who turned 78 on July 7, is at the height of his powers. 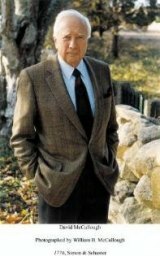 Born and raised in Pittsburgh, David McCullough earned a degree in English literature from Yale University. McCullough has twice received the Pulitzer Prize, for "Truman" and "John Adams", and twice received the National Book Award, for "The Path Between the Seas" and "Mornings on Horseback"; His other widely praised books are "1776", "Brave Companions", "The Great Bridge", and "The Johnstown Flood". He has been honored with the National Book Foundation Distinguished Contribution to American Letters Award, the National Humanities Medal, and the Presidential Medal of Freedom. His website: www.davidmccullough.com.